Venue: Murrayfield, Edinburgh Date: Sunday, 15 February Kick-off: 15:00 GMTCoverage: Live on BBC TV, HD, Red Button, Radio 5 live, BBC Radio Scotland, BBC Radio Wales, Radio Cymru, the BBC Sport website, BBC iPlayer, S4C online, mobile, the BBC Sport app and Connected TV; text commentary on the BBC Sport website. 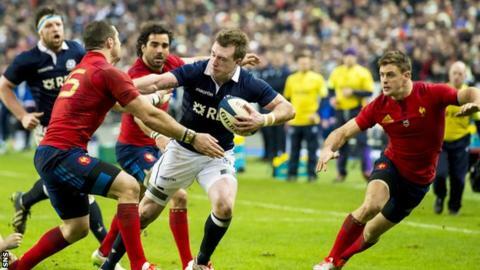 Stuart Hogg insists Scotland will cut out the errors when they entertain Wales in the Six Nations on Sunday. The Scots lost 15-8 in France in their campaign opener on Saturday, with all of the hosts' points coming from Camille Lopez penalties. And fullback Hogg expects a more complete display against the Welsh. "There were a few mistakes, myself included, but it's little things we can amend and hopefully come Sunday we're ready to go," he told BBC Scotland. And the 22-year-old Glasgow star added: "We're massively disappointed. Our mistakes let France in the game, our discipline wasn't great and we gave France cheap field position, we allowed their driving mauls to get going and that was effective for them. "In terms of our attack it was fairly good and our defence was outstanding, zero tries conceded against us so we're fairly happy with that." Dougie Fife scored the only try of the game to pull the score back to 9-8, but Hogg's attempted conversion came back off the upright. The Scots played with 14 men for a spell in the second half after Johnnie Beattie was sin-binned, but still remained in contention until late in the game. "It shows the character of the boys and how much it means to play for Scotland," Hogg added. "We're fighting for the thistle and we're not letting anyone score tries. That was pleasing but in terms of attack we need to keep a hold of the ball and play in the right areas." Hogg was delighted to back in action after an injury lay-off and he says Vern Cotter's Scots have already started to plot Wales' downfall. "We're massively excited for it, Wales are a great team," Hogg said. "We watched their game [Friday's defeat to England] and we know where we can attack them and hopefully beat them. "We'll look at Wales, where they're strong, where they're weak, and where we can exploit those areas."